The Third Annual Atlantic Cup presented by 11th Hour Racing, the only dedicated Class40 race in the United States, kicks off in Charleston, SC on Saturday, May 11. From Charleston, competitors will race double-handed to New York City. 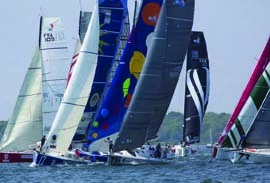 There will be a four or five-day stopover in New York before the race restarts and competitors sprint to Newport, RI. In Newport, teams will race a twoday Inshore Series. Many of the top Class40 sailors in the world are contesting this unique three-leg event. The first stage is the 642-nautical mile Offshore Leg, which includes a passage around treacherous Cape Hatteras. Next is the 231-nautical mile Sprint Leg from New York to Newport, which starts Saturday, May 18. As competitors approach the Rhode Island coast, they’ll have to decide which direction to go around Block Island. The third challenge will be to switch their boats into round-the-buoys mode for the Inshore Series (with a maximum crew of six), which will be sailed just off Fort Adams on May 25 & 26. The combined overall winner of all three stages will be crowned Atlantic Cup Champion. With the help of Newport-based 11th Hour Racing’s sponsorship, The Atlantic Cup will again be one of the most environmentally sustainable races in the U.S. The 2012 edition of the race was the very first carbon neutral yacht race in the country, and this year’s race will also aim for carbon neutrality. Teams are required to have an alternative energy source like a hydrogenerator, fuel cell or solar panels. The Atlantic Cup has teamed up with Rozalia Project for the education component of the 2013 race. A unique and action-based organization, Granville, VT-based Rozalia is determined to find and remove marine debris. Rozalia’s staff will be working alongside event management to clean and educate. In all three marinas the race visits, Rozalia’s ROV (remotely operated underwater vehicle) will be searching for and removing marine debris. The Atlantic Cup’s already engaging education program will gain a valuable component in teaching kids of all ages about marine debris and its effects on natural habitats. If you know of a school that may be interested in participating in one of The Atlantic Cup & Rozalia Project’s Education Workshops, contact Rebecca Inver Moffa, Rozalia’s Science and Education Director, at rebecca@rozaliaproject.org. Double Cross Vodka has signed on as the Official Vodka Partner for the 2013 Atlantic Cup. In each stopover city, Double Cross will be serving up signature Atlantic Cup Cocktails: the Cape Crosser and the Not So Dark & Stormy. Additionally, winners of each leg of the race will be awarded a specially designed, Atlantic Cup-engraved Double Cross Vodka bottle. Handcrafted in the Tatra Mountains of Slovakia, Double Cross Vodka was awarded 95 points by Wine Enthusiast and is a two-time gold medalist at the World Spirits Competition. Visit doublecrossvodka.com to learn more. America’s Cup Charters and The Atlantic Cup have joined forces for a fantastic sailing week (May 23 – 26) in Newport. Almost 100 years after the 12-Metre rule was invented, Class40 sailed into the offshore racing circuit. Both classes were designed within a box rule, allowing designers to optimize yachts for various conditions. The Class40 was chosen for The Atlantic Cup because it’s a fast, versatile and affordable platform…the same reasons the 12 Metre was selected for the America’s Cup in 1958. America’s Cup Charters is offering sailing experiences that combine touring a Class40, watching the inshore races, and sailing aboard a historic 12-Metre yacht. Call 401-846-9886 to reserve tickets. For more information, visit americascupcharters. com/announcements/atlantic-cup-racing-and-americas-cupcharters-team-up. As in 2012, the Official Guide to The Atlantic Cup presented by 11th Hour Racing will appear in the May issue of WindCheck. For more information and to track the racers online, visit AtlanticCup.org.